(CNN) -- Grammy Award winners Alicia Keys and John Legend will perform at "CNN Heroes: An All-Star Tribute," airing on Thanksgiving on CNN. 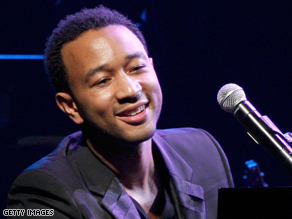 John Legend will sing "If You're Out There" from his just-released album "Evolver." Hosted by CNN's Anderson Cooper, the program honors the top 10 CNN Heroes of 2008 at the Kodak Theatre in Hollywood, California. The show will be broadcast globally on CNN, CNN International and CNN en Español at 9 p.m. ET/PT November 27 (0200 GMT November 28). Each of this year's top 10 CNN Heroes will be honored in a documentary tribute and introduced by a celebrity presenter. In addition, actor Hugh Jackman will present People magazine's 2008 Heroes Among Us award to six recipients honored by the magazine this year. People is partnering with CNN for this portion of the telecast. Keys will perform "Superwoman" from her hit album "As I Am." Legend, backed by the Los Angeles-based Agape Choir, will sing "If You're Out There" from his just-released album "Evolver." The evening will culminate with the announcement of the CNN Hero of the Year, chosen through a six-week online poll that generated more than 1 million votes. Viewers were asked to select the CNN Hero who inspired them the most from among the top 10 CNN Heroes selected by a blue-ribbon panel. Award-winning producer-director Joel Gallen returns to executive produce this year's program. Among his credits, Gallen produced telethon events supporting victims of the September 11 terrorist attacks and Hurricane Katrina, winning an Emmy Award and a Peabody Award for "America: A Tribute to Heroes." Kodak Theatre is a 3,400-seat venue that opened in November 2001 and is best known as the first permanent home of the Academy Awards.